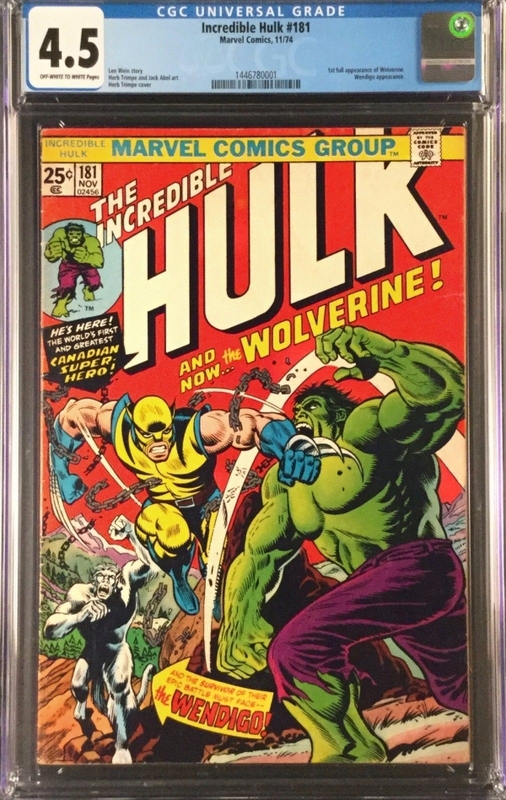 Incredible Hulk # 181 1st Wolverine KEY! Awesome CGC! Nice early Silver Age collection of books. AWESOME SILVER AGE MARVEL for your collection!!! This is your chance to get an early run of Silver Age Marvels! Scan shows clearly the condition of book. Book lays mostly flat and has nice sheen on front cover. Very solid and attractive book. Still has lots of glossy colors and supple interior pages. Some nice impressive color luster on the front cover. Back cover is pretty clean with some handling and off white from age. Looks like it was just read a few times and then stored away. Don't let this one get away! KILLER BOOK! Looks about near FN Grade, looks so much nicer than the grade given! or to give as a GIFT that you'd be proud to give since these are BEAUTIFUL Books. Grade given is typical of the overall condition & intrinsic flaws associated with acceptable defects allowed in this grade. This is an original book we inspected with no known restoration unless stated. This is a FANTASTIC looking book with the story to match! choose to get it cleaned/pressed and then re-slabbed. Typically increases value 25-35%. See our GREAT feedback. We unconditionally guarantee our comics, if you need a LARGER IMAGE just use your "Ctrl +" keys to enlarge screen. 1. If there is NO SCAN/WRONG SCAN..... Please do not bid so I can fix the error (errors cannot be fixed after a bid is placed). 2. Do not contact me after you win an auction to ask questions. If you win it... Please pay for your item. our Seller Status and I GUARANTEE** , that I will fix your problem better. 5. If you feel 5 STARS for me is not warranted, please contact me and let me make you a happy customer. 6. If your feedback can't be positive in every way, please contact me as to why and let me fix it. 7. Do not renegotiate auction ending prices or shipping costs after you won the auction. See below. No Reserve Auction, Bidder takes this HOME! Don't wait until the last minute to bid! ending we reserve the right to cancel the auction. We have a great 'no hassle', 'no questions asked' return policy. We can take MasterCard, Visa, Discover, American Express and Paypal or you can mail in your payment. we don't mind at all if you check with us on the status of an order, but don't blame us if it takes a long time. include correct shipping. Invoices with more than 2 slab books will need to be calculated after. Canadian Shipping: is $36.99 for first comic and then $1.99 each after that. This is for priority mail with insurance. Orders totalling over $250 will have figured accordingly to cover shipping an insurance, postage, etc. We can ship most anywhere in the world. Regular international shipping is $49.99 for the first item and then $1.99 thereafter. at $250.00 or more then your package will be mailed Priority Mail with insurance. We will send you an invoice that reflects that cost. minimal, fast payment is needed. All returned items are subject to a 15% restocking fee. if you win a lot of auctions, your shipping costs may appear high. Otherwise, our shipping costs are NON-NEGOTICIABLE. you to pay another $1.99 for shipping? You already got a KILLER deal. prior to bidding otherwise I'll have to cancel the auction. we often include free Silver Age Marvel titles similar to what you win for FREE if you are a repeat winner or make a request. The free stuff we send OFFSETS shipping costs. IF you win some of our auctions, you don't have to wait for an email from us. You can calculate the total & make payment. auction & have to cancel it & start over. We have lowest prices on Golden & Silver Age Comics! See our Feedback and Buy with Confidence! ebay. Using Ebay's customer service is not needed to fix a problem because I will fix any problem better** as noted below. We're here to make a Customer for life, not for just one sale. It can take up to 30 DAYS or longer for your items(s) to arrive to you through your country's customs and postal systems. delays caused by your country's customs and mailing systems. Please keep this in mind when leaving your Feedback and DSRs. but we will WOW YOU by fixing the problem by offering one or more of the following: 1. Refund of auction ending price. does not merit buying any of our awesome items. grade, we will even give you a $25 future auction credit for any inconvenience. We always want you to be happy with your purchase. Nobody offers a better guarantee than we do!